Welcome to my review of the Celestron Nature 10×25 Monocular. This monocular is designed for easy carry whether backpacking or kayaking, or anything in between. Only 6 inches long, it weights a mere 6 ounces, so it’s easy to add this monocular to your kit without burdening yourself with excess bulk or weight. Just how well the monocular performs in the outdoors, though, requires a bit more discussion. Let’s see how well the Celestron Nature 10×25 Monocular shapes up! The neck lanyard and carrying case are decent quality, but aren’t the most outstanding accessories you might come across. The lanyard is not padded, but that might not be much of a concern for such a lightweight optic. The case includes a snap to attach it to a belt, but this snap is poorly made and comes loose far too easily. I’ve stopped using the case at all, except for storage, and just carry the monocular around my neck with the lanyard. How Powerful Is the Celestron Nature 10×25 Monocular? 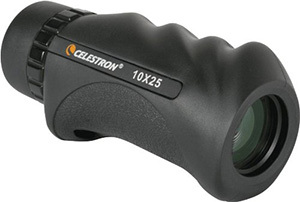 The Celestron Nature 10×25 Monocular features a 25mm objective lens with 10X magnification. The clarity and resolution is quite good, as one would expect from a name like Celestron. Some users have complained about the image being shaky at 10X magnification, but this is something that should be expected at that magnification level. Unfortunately, the Nature 10×25 does not have a tripod mount, so if you have shaky hands, you might want to choose a different monocular. This is an extremely lightweight monocular, and shakiness has to be expected if you don’t have steady hands. What Type of Optics Does the Celestron Nature 10×25 Monocular Have? This monocular features BaK-4 roof prism optics, and the air-to-glass surfaces are all multi-coated. The barrel is nitrogen-charged to provide protection against fogging, and the lenses are O-ring sealed to keep water out. I’ve dunked my Celestron Nature 10×25 Monocular in the river several times while kayaking, and it has not suffered a bit of water damage. The linear field of view on the Celestron Nature 10×25 Monocular is 304 feet at 1,000 yards, allowing a generous size view through the monocular. 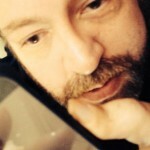 Images are crisp and clear, with plenty of contrast and detail. Light transmission is fantastic, and I’ve been able to use this monocular to spot critters in shadows and in low-light conditions on many occasions. The focus ring on this monocular is very stiff. I thought it might improve over time, but it has not loosened up a bit since I first unboxed the Celestron Nature 10×25 Monocular. What does this mean for real-life use? If you’re focusing mainly on stationary objects, it won’t affect you much–once you focus, it will stay focused. However, if you want to view moving objects, you will find it difficult to focus on them as they move closer to or further away from you. The body of the Celestron Nature 10×25 Monocular is rubber-covered for protection, and the monocular is quite shockproof. I’ve had it bounce off rock walls around my neck, drop several times to the dirt trail, and even dropped it from a 15′ tree stand a time or two. The body is scuffed up, but there’s been no harm done to the prism or any of the rest of the optical system. The rubber finger grooves on the top of the monocular are a nice touch, making this monocular easy to hold even when it’s cold or rainy, or you’re wearing gloves. Celestron has obviously put a lot of thought into the design of this compact little monocular, and it definitely works well for a travel monocular. My one complaint about the body of this monocular is the placement of the lanyard hole. When the lanyard is attached, it interferes with the focus ring a bit. If you try to turn the focus ring from the bottom of the monocular, the lanyard blocks your access to the lanyard. There’s no workaround for this other than focusing from the top of the unit, which is annoying sometimes. As stated in the previous section, the Celestron Nature 10×25 Monocular is very rugged and durable. The overall chassis has been designed with an eye towards protecting the optics, including the lenses, even down to the placement of the front lens itself. The front lens sits offset from the front of the body, so it would be very difficult to scratch the lens, even if you dropped the monocular front-first onto rocky terrain. How Well Does the Celestron Nature 10×25 Monocular Work in the Field? There’s the key question, eh? How well does this monocular work under real-life conditions? Well, I’ve already described some of the ways I’ve used this monocular, and it’s worked very well in those situations. This monocular would work best for terrain-viewing, concert-viewing, or any other situation where your target image is either stationary or slow-moving. If you’re trying to use it to watch birds or other fast-moving subjects, though, the stiff focus ring will lead to quite a bit of frustration and annoyance. Thanks for reading this review of the Celestron Nature 10x25 Monocular. This is a great little monocular, and it's one that I've found quite a few uses for. Unfortunately, it doesn't fit the bill for scouting out moving targets, but it works great for viewing landscapes or other stationary subjects.